Jeff Bridgman Antique Flags and Painted Furniture - 44 STARS, RARE WITH ADVERTISING FOR A PENNSYLVANIA CHAPTER OF THE Jr.O.U.A.M. Flag Size (H x L): 58.5" x 92"
This is one of only 2 sewn flags currently known to exist from the Junior Order of United American Mechanics, which was one of the mid-19th century nativist fraternal organizations, founded on May 17th, 1853, at the Concord School House in Germantown, Pennsylvania (later part of Philadelphia). 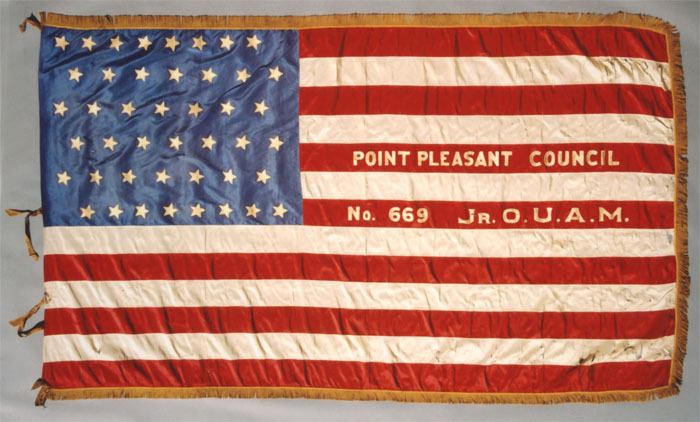 Point Pleasant, Pennsylvania, was home to the chapter that owned this flag, in Bucks County, just north of Philadelphia, near Newtown. The stars and the lettering are painted in one shade of gilding and outlined in another, which provides for an interesting effect. The stars are arranged in zigzagging rows with 8 stars at the top and bottom and 7 in those inbetween. The flag was turned over on itself to create the open sleeve hoist and silk ties were affixed for attaching the flag to a staff. The three remaining sides were bound with a heavy gold fringe. 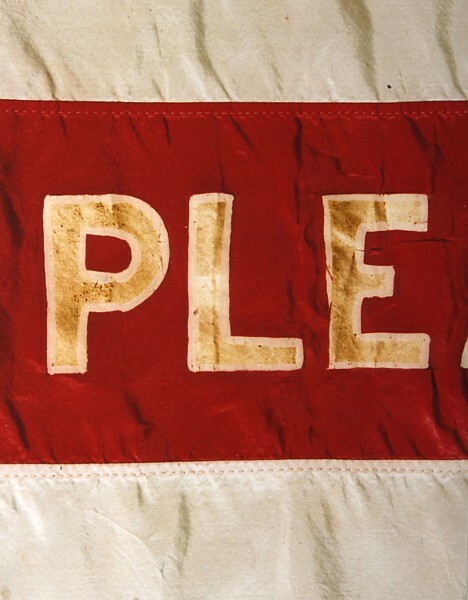 Congress passed a law that prohibited this type of advertising on the American national flag 1905, but during the 19th century it was common practice to use the Stars & Stripes for this purpose. 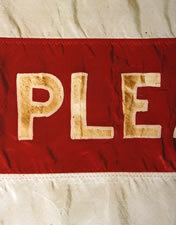 Today surviving examples of these flags, carefully embellished with text and images, are among the most interesting and sought-after by collectors. Unlike more common flags of the period, these record the manner of their use in a colorful and interesting way that elevates them to another level in terms of both historical significance and graphic presentation. The 44th state, Wyoming, gained statehood on July 10th, 1890. 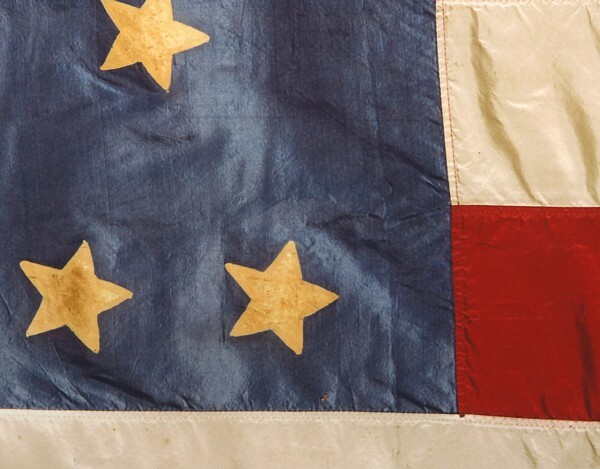 Many flag makers would have began to add a 44th star to their flags on or before that day and the 44 star flag would have generally seen use until the addition of Utah in 1896. As early as the 1840's there was great concern about the ever-growing population of America. One of the agendas of the Jr.O.U.A.M. was to subvert both present and future immigration. Members were required to undertake efforts to campaign against the hiring of cheap foreign labor. They were also charged to patronize only "American" businesses. Their motto was "Virtue, Liberty, and Patriotism" and they wore fraternal attire that was decorated in red, white and blue. Membership in the Junior Order was not confined to craftsmen or mechanics. Instead the use of the word "mechanics" was intended to serve a dual purpose, indicating builders of character, integrity, and citizenship as well as the builders of objects. The Jr.O.U.A.M. was an outgrowth of the O.U.A.M., which had been organized in Philadelphia during the anti-alien riots of 1844-45. It was aimed at interesting youth and preparing them for membership in the parent organization. While one might expect that 19th century artifacts of the O.U.A.M. would be more desirable among collectors than the Junior Order, it is, in fact, the latter that seems to have produced most of the interesting folk art and patriotic textiles. In addition, today the term "Junior" had only short-term historical significance, because the two organizations effectively blended. Like many of the 19th century fraternal groups, the Jr.O.U.A.M. still exists today. It is much smaller, however, with chapters in only nine states. Condition: There is moderate breakdown in the silk, especially at the fly end. There are some stitch repairs, and some repairs with clear tape on the reverse side. One of the silk ties is absent. This is a fragile flag, but the rarity of its gilt painted stars and advertising make it a highly desired example in any almost any condition. The overall presentation is excellent.